I'm starting to collect new items for my spare bedroom as I am going to be redecorating it very soon. These are just a few of my new things. The bedroom will be very French inspired as you can see! I adore the cover of the book; such a beautiful picture of Brigette Bardot. S and I went away for a weekend break to a quaint place called Hebden Bridge. We fell in love with it straightaway; there are so many funky little shops to look round. The beautiful cupcake soaps and glass dish were from a shop called The Yorkshire Soap Co. It is one of the nicest shops I have ever been in. I spent at least an hour trying to decide which soaps to have! Decisions, decisions! I will post before and after pictures of the room renovation when I start the new project. Stay tuned. Homemade lamb and feta burgers in the winter season I hear you say! I did think to myself 'is this just a recipe for summer when we all get out our barbecues'. Why not, I thought, and I'm so glad I did. Myself and S enjoyed these lovelies for lunch and they were delicious. So here is the recipe for you to try too. Place the lamb mince into a bowl and add crumbled feta, the grated onion, harissa paste and chopped parsley. Season with salt and pepper and shape into four burgers. Griddle or grill for between four to five minutes each side. At this stage they can be placed in the freezer for another time. Just defrost in the fridge before griddling. 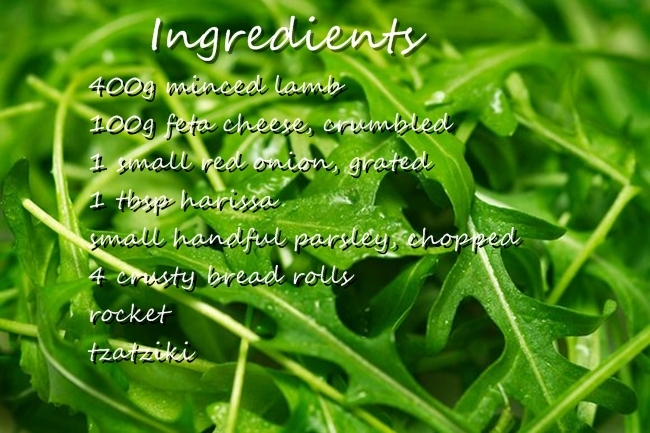 Serve on a bed of rocket with a dollop of home made tzatziki. 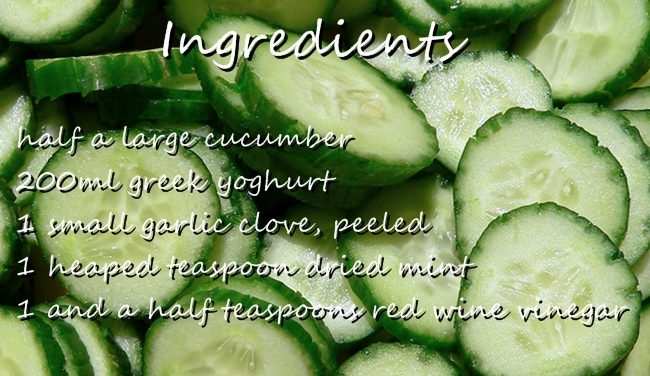 Click here for tzatziki recipe. This is the outfit I chose for work today. Felt a little bit grey and blue due to the very cold morning! You can't really see here how frosty it is but the sun was shining and I have to say I prefer cold and sunny rather than warm and wet! This dress is made of wool; perfect for winter. It's very versatile too because I can interchange it with a grey top and blue wool tights and grey shoes. What's your perfect winter work outfit? I decided to wear this outfit for a country walk we had today. We are lucky to live around the corner from fields that stretch for miles. 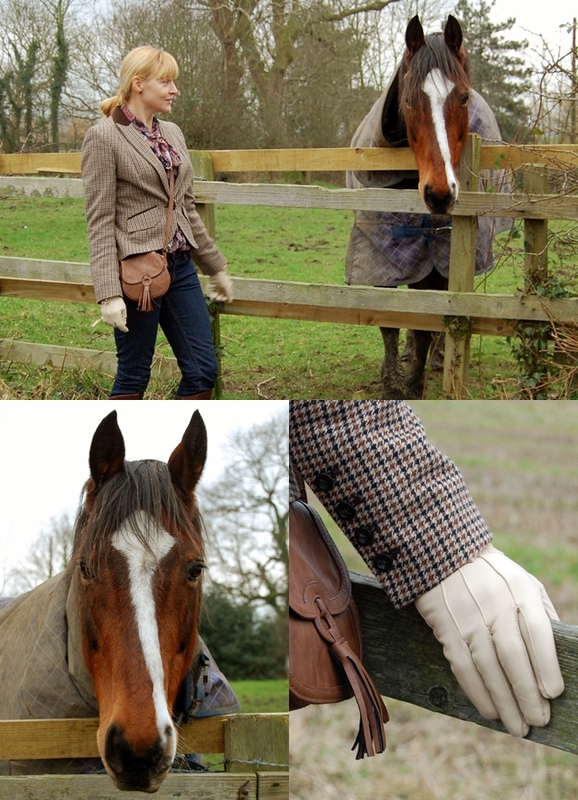 This tweed riding jacket is ideal for cold days like this and I wear it during more than one season so it is very versatile too. 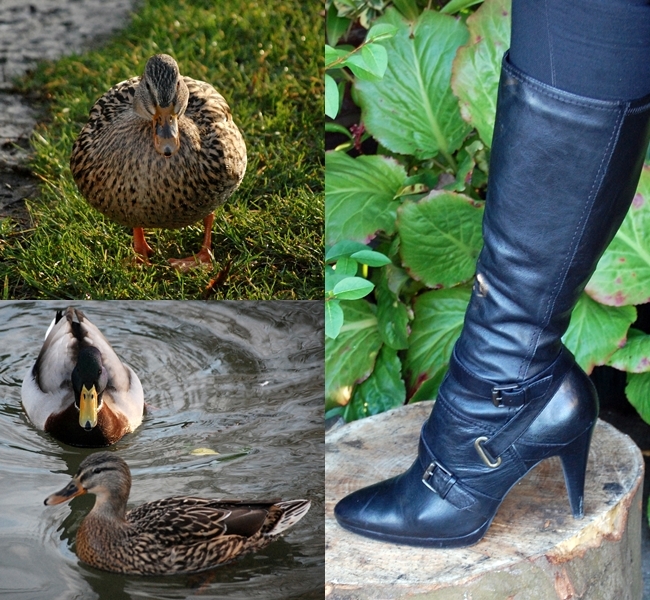 Today I wore it with a pretty paisley blouse and my well worn riding boots; they are soooo comfortable. They were a really good buy as I have had them a couple of years and they still have loads of life left in them! Found the horse, just need my jodphurs now. As you can see the horse was desperately trying to get our attention (I think it thought we had food). Promised the horse I would take it some carrots next time! The church you can see in the background is in the village we live in, it was built in 1869 and is very quaint and cute. It makes for a lovely picture especially when it snows. I love the bustle that is on the back of my jacket, I think this is a lovely feature making it stand out. What do you wear tweed jackets with? Just looking at this picture is making me drool! My friends and family know me soooo well. These are a few pressies I was lucky enough to get for Christmas. I have been looking for a coffee grinder but haven't seen one I like. S managed to find me one in a little antique shop and it's perfect. Below it are the most gorgeous tasting chocolate coated coffee beans! There's nothing better than a small glass of Bailey's coffee liqueur, so comforting to have at the end of a cold day. I have to say that I had not tasted this flavour before, but it presses all the right buttons for me and it has served me well over Christmas! The chocolate spoons will definitely be used as part of a dessert; watch this space! Green & Blacks has to be the winner in my top ten of favourite chocolate. I love all the flavours, so rich and creamy. I need to stop talking about it or I will be looking in the cupboard for some and I'm being a good girl today! I love the little pink & white tin of choccie nibbles from S. They were part of my stocking presents; great for a naughty snack! The handmade card was sent to me by my mum. She enjoys making them and sending them to all her family and friends. What is your naughty chocolate treat? I'm feeling a very happy girl as I received these gorgeous blue Aldo boots, that I had been having dreams about, for Christmas from S. Definitely a dream come true! Now I am thinking about what outfit would look good with them and show them off. I also received a lovely black dress and black leather jacket for Christmas; will try the boots with these and see how they look. What outfit do you think would look good with these gorgeous boots? It has to be in front of the fire with my weekly reading and a glass of wine. When it's cold outside this has to be one of my favourite places to be. I have been doing this as often as possible since we renovated this room. There was a gas fire here before and we took it out and knocked through to restore the original fireplace. The bricks for the arch and hearth are all reclaimed so we could make it look more authentic. The finishing touches, which we were lucky enough to get as bargains from E-bay, were this rocking chair, an old pine table with beech chairs and a sideboard. The paint we used for the floorboards and walls were from Farrow & Ball. My reading for this week is a mixture of second hand books (gotta love Amazon) that I have been wanting for a while. I am looking forward to reading Tony Curtis' autobiography. I love watching his films especially Some Like It Hot, which is a real favourite of mine. He has to be one of the greatest actors ever! The other two books on my list this week are Nylon Street (love street style) and Anais Nin's A Spy in the House of Love, which a friend has recommended. Lots to keep me occupied on cold nights in front of my woodburner. 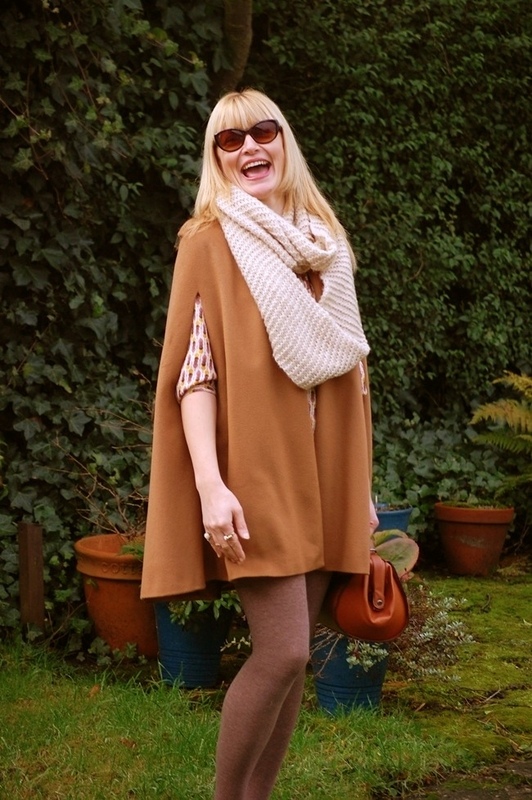 I have to say I love my trusty Zara cape. I have had it a while now but it still feels like new. It is so versatile, being able to dress it up and wear with jeans. 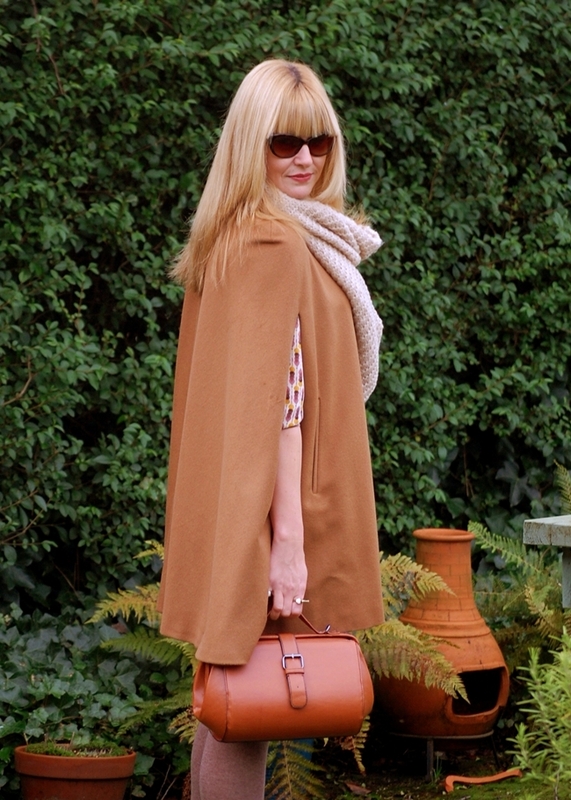 Today I wore it for a shopping trip with my daughter (very easy to take on and off when trying clothes on!). I had been searching for quite a while for a bag this shape and I finally found one, unexpectedly, in a shop where I would never have thought of looking. I was a very happy girl! The scarf was a stocking present from S which I think works well with the cape, and its sooooo soft and cosy too. I thought I would test these lovely brogues out today. They have been sitting in the wardrobe waiting to be worn since I bought them in a sale. They are the same colour as the maroon in my dress and I adore them. Brogues are definitely one of my favourite types of shoes to wear. Well, that Cosmopolitan (and several like it) are gone...... and very nice they were too! So, it's a new year and a good time to reflect. This year I am going to make the time to be more creative and learn new things. I will make time for my blog and get better at photography and writing. The last six months have been a bit of a rocky road but this year will be better; I am determined. Happy New Year everyone and thanks to all the bloggers who have given me inspiration.